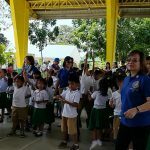 Inner Wheel Club District 383 together with Rotary Club Makati North sponsored an Anti-Cyber Bullying Seminar for 150 grade 6 students of Francisco Benitez Elementary School last September 4,2015.Speakers were from Philippine National Police P/Supt. Ivy Castillo and PO2 Grace Sanchez. 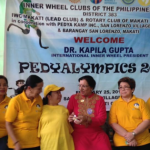 IWC Makati North President Minnie Rualo Elizaga is the IWCPI District 383 Anti Bullying Committee Head for this Inner Wheel Year. Different clubs of IWCPI District 383 implemented Ecology and Environment Projects to save mother earth. 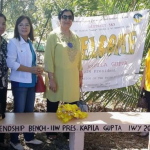 District Chairman Ann Margaret San Antonio, together with with IWC Las Pinas President Jaja and Sen. Villar led the tree planting at Inner Wheel Ecopark in Las Pinas. 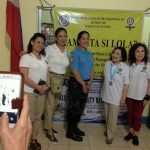 President Ninia Rodil led the IWC Makati San Antonio Ladies mangrove planting in Marinduque. Members of IWCPI District 383 joined the Ecology Waste Management Tour in Barangay Philam, Quezon City.